My lovely painting assistant hard a work. The opinions are shouted back and forth, ringing inside my head. Eventually, I make my choice and try to move forward—but there really isn’t any peace to be had since I can’t immediately know whether or not I made the right choice. Sure, the glue works in the garage, but what really matters is what happens in the water—and that won’t be revealed for months or even years. I glued my keel sixteen months ago; that’s a long time to wonder about the strength of plastic resin glue. To remain sane, I just try to put the doubts aside. But there is always something new to worry about and the latest conundrum concerns paint. When painting my house, I only worry about color choices; when I want to freshen up my living room, I look at some chips and then pick from the available stock of latex paints at the home center. But when it comes to boat building, color schemes are the least of my worries. My secret fear is that my paint will dissolve on contact with water. I need something that not only looks spiffy, but will also hold up in the Chesapeake Bay. The safest route is to buy marine paint. But these are very (often very, very) expensive and I summarily rejected this option. Instead, I am attracted to builders and designers who insist that a good quality exterior house paint is just fine. It’s the choice of Dynamite Payson, Jim Mikalack, and—not surprising—Pete Stevenson, my boat’s designer. 1. Do I need to use a primer? 2. If so, what is the best brand? 3. Is oil based paint better than latex? 4. Is one brand better than another? 5. How many coats is enough? To each question there were a dozen opinions, most contradictory. Many builders use primer and there are many references to a common brand called Kilz II. But others argue that it’s unnecessary to prime over epoxy. I’m torn, but I then come across information from West System, the epoxy manufacturer. They tested several “over the counter” primers and declared that one brand, Zinsser 1-2-3, has especially good adhesion and durability. Since I was also worried about adhesion of the paint on my epoxied hull, this information tipped the balance and I bought a gallon for about $15. One problem solved. But the question about oil or latex paint was equally troubling. Both have their champions. Latex is user friendly and dries quickly. Oil based paints are easier to remove and more flexible. There is a third faction that swears by Rustoleum. I go back and forth but finally decide to use oil-based porch and floor paint from my local Ace Hardware, mostly because I had recently used it on my front porch and was impressed with its durability. While the boat was still upside down, I recruited a couple of willing helpers—my oldest son and my daughter—to help paint two coats of the fast-drying primer, followed by two coats of paint on the keel and bottom. The work was easy and wonderfully stress-free after so many days of ‘glassing and sanding. As an experiment, I also put small dabs of paint directly on the unprimed hull sides, deliberately choosing spots that were sanded and unsanded. I wanted to test the adhesion of paint on various surfaces. Over the next week, I scratched and picked at the paint as it continued to dry and I decided that the portion painted over sanded epoxy did, in fact, stick slightly (but only slightly) better than paint on unsanded epoxy. I also decided that the paint held well without primer and, in fact, it might even have better adhesion without the primer. My methods were not very scientific, but I decided, based on my findings, to stop using primer and simply slap the paint over the sanded hull and cabin. Again, that’s what the Stevenson’s recommend. In this and other small ways I am starting to view this boat as one big experiment. Over the past year, I have actually used three different glues and now it seems that I will experiment with several different methods of painting. Later on, I even plan to leave a few small areas of the cockpit unfiberglassed just to see how quickly and badly plywood will check when it is protected with nothing more than paint. It’s all part of a increasingly philosophical approach to this project, one that is built on the conviction that this boat is only the first of many boats to come and that I will succeed no matter what happens simply because, once it is finished, I will have finally learned how to build a boat. My last post was, I admit, a bit negative and, frankly, not really in character. Any essay titled “Why I Hate Boatbuilding” requires further explanation. This is sawdust, not epoxy, but you get the idea. I'm smiling here, but I wasn't so happy after sanding the epoxy. You may recall that I was reacting to a day spent sanding (or “fairing” to use the appropriate terminology) the epoxy-coated hull. Grinding away the uneven surface with a belt sander exposed me to a nasty cloud of epoxy dust, which is both unpleasant and unhealthy. I kept reassuring myself that I was taking extra precaution by using a respirator, but I still developed a persistent cough that lasted for several days. I was ready to swear off epoxy and fiberglass forever and even now I am aggressively investigating building techniques that limit the use of epoxy. Who knows, my next boat might be a traditionally planked cruiser. More likely, it will simply be another plywood boat, but one that is held together with non-toxic glue, such as Titebond III, and no more fiberglass than necessary to cover the seams. But I still need to finish this boat, which means that I need to make at least temporary peace with epoxy. Happily, I discovered several strategies that significantly lessen the amount of dust in the air. First, and most obviously, I needed to get the dust out of the garage. I moved the boat closer to the double garage doors and positioned a fan behind the boat so that, in theory, dust would blow out and disappear. This helped, at least psychologically, as did my decision to keep the respirator on even after I finished sanding. I didn’t want to breathe in particles that lingered in the air. But what most helped were changes in how I applied epoxy and how I sanded it down. New to the process of fiberglassing, I applied thick and uneven coats to the underside, which simply ended up as dust when I ground it down with the belt sander. But as my skills improved, I learned to apply thin, even coats that require less sanding. That was a major step forward. Finally, and most recently, I discovered the advantages of wet sanding. This is not really part of my repertoire as a woodworker (you don’t wet sand a cherry table, for example), but a passing reference to this technique by an online correspondent made me curious and I immediately went to the garage, dipped some 80 grit sandpaper in water and discovered that it’s possible to fair the hull without making any dust at all. The disadvantage is that I need to sand by hand (for god’s sake, don’t dunk your belt sander in a bucket), but that’s small price to pay for peace of mind and, besides, I don’t like belt sanders anyway. So the end of the story is that I no longer worry so much about epoxy and I think I can finish the project without having a visit by the EPA. But I still feel that epoxy and fiberglass—which are treated as necessary and magical ingredients in boat building—deserve to be treated with caution and used sparingly. Time and time again, I see builders deride old or nontoxic techniques for assembling and waterproofing boats. “Don’t use [fill in the blank]; epoxy is better!” is the common refrain. And in some ways, they are right. It’s the strongest, most waterproof adhesive available, as far as I know. But there are always other factors worth considering when choosing glues and coverings—ranging from cost (epoxy is more expensive than other kinds of glues) to environmental considerations (why do I recycle plastic bags in the house, but build a plastic-covered boat in the garage?) to justifiable worries about health (people can develop allergic reactions to uncured epoxy and dust is bad for the lungs). And, finally, there are aesthetic considerations. At the very least, it’s an unpleasant substance to work with—a material to be tolerated more than enjoyed as it fills the air with acrid fumes and sticks to the skin with irritating tenacity. And anything that takes joy away from a hobby deserves scrutiny. My mood turned sour this weekend as I discovered the most unpleasant task in boat building. Buoyant from my success with fiberglassing, I returned to the garage ready to prepare the bottom and keel for painting. All I needed to do was make a quick trip around the boat with a sander—or so I thought. But I learned that it takes a great deal of time to get even a moderately smooth surface that is fully prepped for painting. Furthermore, I learned that there are few things more unappealing than spending a Saturday hunched over a whining belt sander while fine epoxy dust forms a thick and (surely) unhealthy cloud around my head. Yes, I was wearing a respirator, but the whole experience was antithetical to everything I associate with woodworking, sailing, and healthy living. 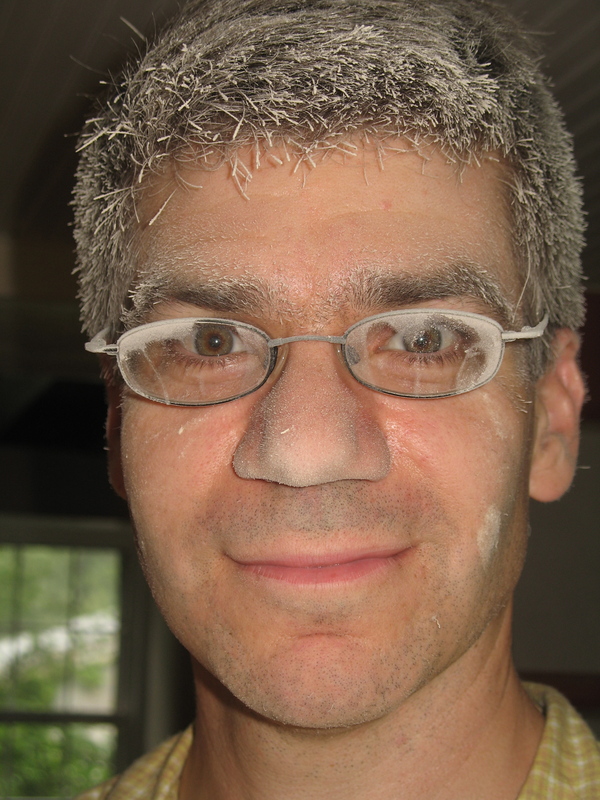 Instead of aromatic wood shavings and fresh breezes, I left the garage coated in powder, my ears ringing, certain that I had turned my workspace into a future Superfund site. I’m not a perfectionist; I don’t mind a somewhat uneven surface, especially on the boat’s bottom, which will remain hidden to all but the fishes. Given the option, I wouldn’t sand the bottom at all. But all boat building books in my possession agree that it is important to sand epoxied surfaces before applying primers and paints. Only by roughing the surface with aggressive application of 80 grit paper will the glossy epoxy have the necessary tooth to hold primer in place. On some forums, builders are told that a quick once over isn’t good enough; it’s important to remove all the gloss. Of course, I can’t verify the truth of these statements. They make sense intuitively, but I don’t really know the difference between sufficient and inadequate sanding, so, like many novices, I felt compelled to take the safest route, which meant that I spent a full morning grinding away a startling amount of epoxy and creating an atmosphere filled with more dust than oxygen. I came in for lunch so disgusted and dissatisfied that I actually declared to my wife that I would never—ever—build a fiberglassed boat again. Instead, I might build traditional boats—the kind that use oak timbers shaped by hand planes and sealed with pine tar and oakum (whatever that is). 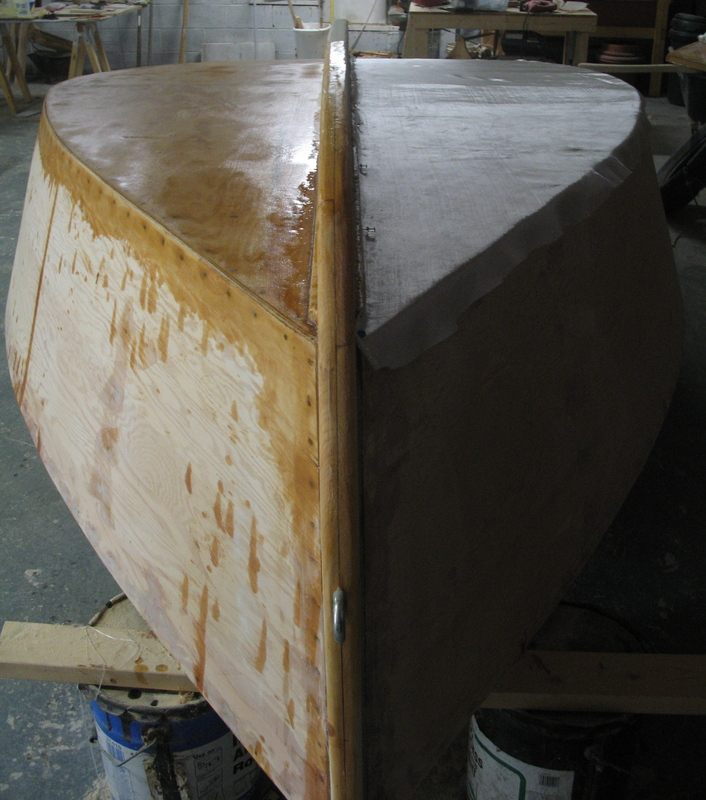 Alternately, I could take the opposite path and simply build my plywood boats without fiberglassing the hulls. Lots of people take this fast and cheap route (including Jim Michalak, one of my favorite designers). Sure, the cheaper plywoods will eventually check, but the boats will still float. I’d rather repaint every year than spend whole days sanding two hundred square feet of epoxy. In the end, I don’t really hate boat building. But I am frustrated that that this one part of the process—so integral to the construction of modern plywood boats—is also so unnerving. I have lots of boats I want to build, but I need to find a way to build them in a healthy and satisfying way. The day I dreaded for more than a year arrived earlier this week. After two weeks of sanding, I was finally ready to fiberglass. Six ounce cloth, pinned into place. The fabic has a nice drape and wrinkles are not a problem. 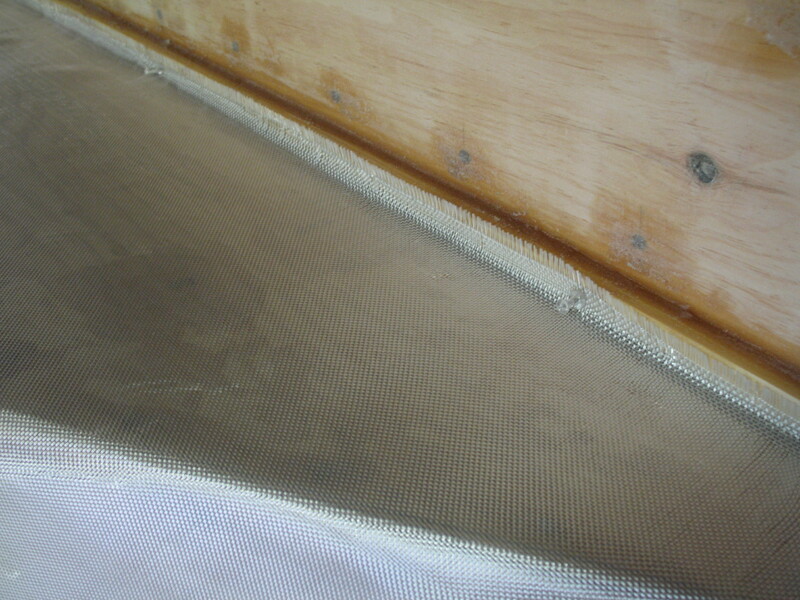 A close-up of the fabric showing how it meets the edge of the keel. Now you see it, now you don't. The fabric on the left side turned transparent after the first coat of epoxy. You might recall that I began preparing for this day nearly six months ago when I practiced fiberglassing the hatch cover and rudder. 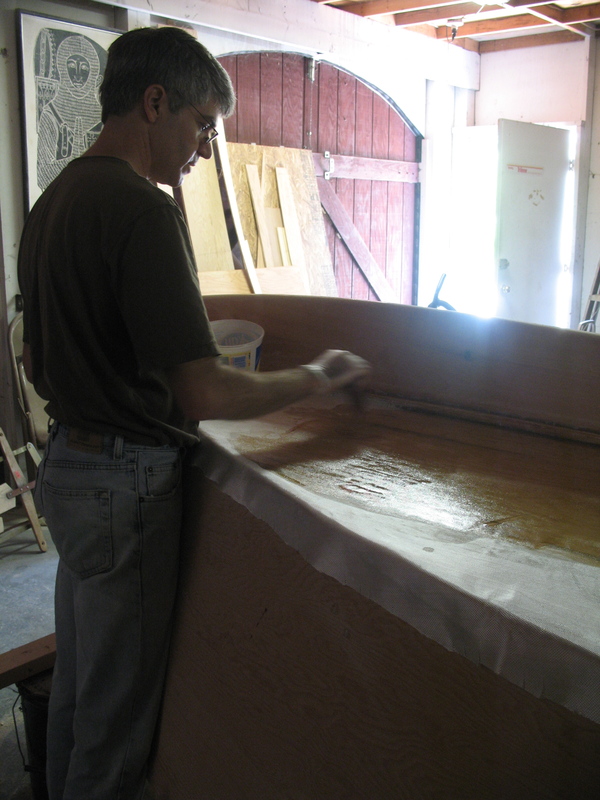 I quickly learned that fiberglassing, despite its reputation as an alchemist’s art, is relatively straightforward. 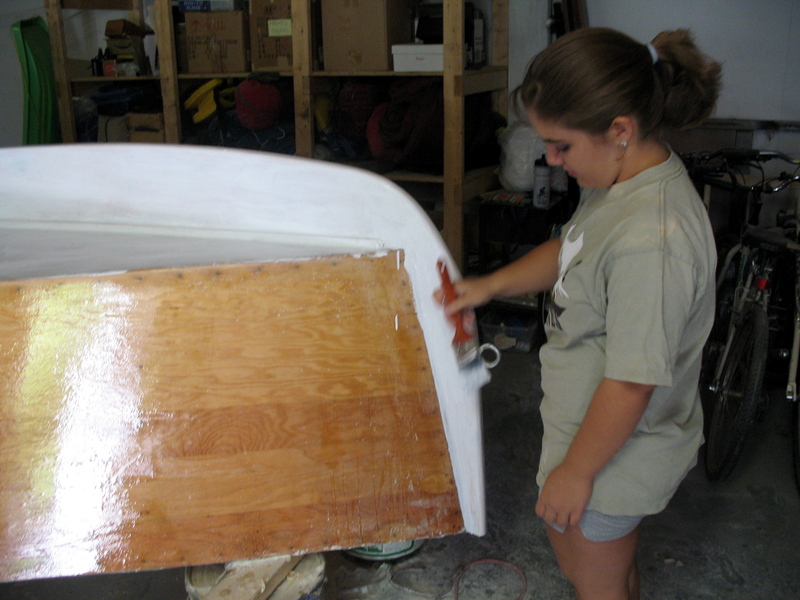 It is simply the process of adhering a white cloth-like material to plywood with several coats marine epoxy. I am told that this step protects wood with a waterproof membrane, adds some strength, and prevents unsightly checking of douglas fir plywood. Before beginning work on the hull, I reviewed a wonderfully helpful two minute instructional video produced by West Systems, one of the major epoxy manufacturers. The online video reminded me to place the fiberglass cloth over the bare wood, pour some unthickened epoxy in the center, the gently spread the syrup-like substance over the surface with a rubber paddle, pushing the epoxy toward the edges. The cloth turns nearly transparent as epoxy fills the weave. In nearly every case, additional coats are recommended to fully fill the weave and leave a smooth surface. It’s possible to wait for the first coat to harden, and then apply a second coat after sanding. That was my strategy with the hatch cover. But the video told me that I could apply the second and third coats after each preceding coat turned about as tacky as masking tape. This produces a stronger bond and eliminates the need for sanding—a real advantage, in my opinion. I hate sanding epoxy. So I set aside the entire day and decided that, come sundown, I would have a fully ‘glassed boat bottom. Boat builders are an ornery bunch and they can argue over anything and there is an ongoing battle over best weight of fiberglass. It’s possible to buy cloth as thin as fine silk (two or three oz by weight) or as thick as canvas (eight or ten oz). The thinner cloth is lighter and needs less epoxy. However, the heavier fiberglass produces a stronger, more rugged hull. So priorities must be established. Some of us want to build butterflies—spare and elemental; others want tanks—impenetrable and protecting. I can’t help but believe that deeper values and worldviews are being expressed by our choice of cloth. My choice? In keeping with my personality, I looked for the middle ground and followed the advice of people I know and trust. Chuck Leinweber, editor of Duckworks magazine and merchant of economical boat building supplies, advised me in a series of emails to go as light as possible but add some strength where it counts. His recommendation was six ounce cloth for the bottom, and four ounce cloth for the sides, deck and cockpit. I dutifully complied. On the appointed day, I began by unrolling fourteen feet of the six ounce fiberglass, laying it along the port side of the boat’s bottom and holding it in place with pushpins spaced every two or three feet. I then trimmed the fabric along the outside edge of the boat, letting it drape over the sides by a couple of inches. I mixed a double batch of epoxy (four squirts of the epoxy, two squirts of hardener) and began the methodical process of adhering the fabric, taking long, firm sweeps across the fabric with my paddle. The goal is to saturate the cloth and avoid bubbles. It sounds tricky, but it’s actually easy work. When the first coat is finished—five batches in all—I repeated the process on the starboard side. An hour later, I returned to the port side and applied the second coat. This took even less less time and used about half the amount of epoxy. Once again I walked around the boat and did the same thing to the starboard half. Back and forth I went until, by mid afternoon, I had three full coats on both sides. One part that is not fiberglassed is the boat’s keel. 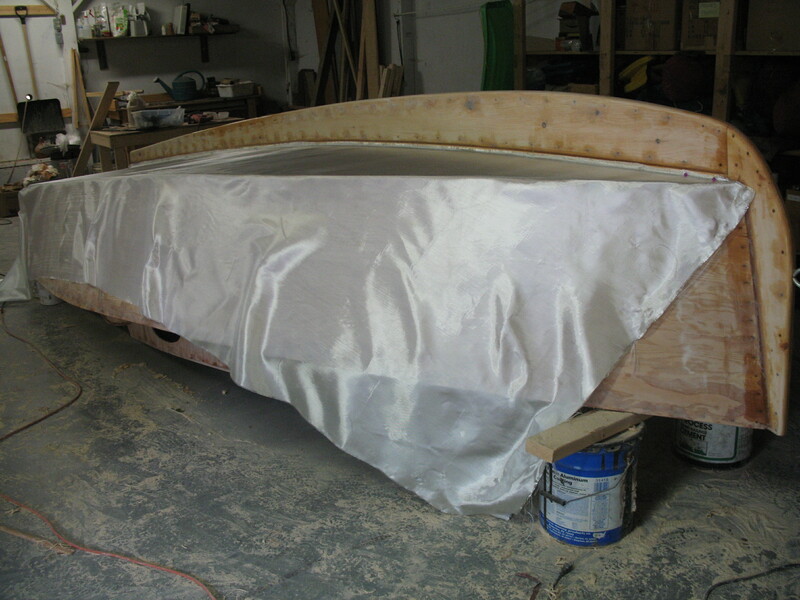 If there is any consensus within the Stevenson boat building community, it is this: Don’t fiberglass the keel, no matter how much you may want to! New builders like the idea of encasing the softwood keel. It makes sense to protect a part of the boat that takes the most abrasion. But experienced builders insist that this actually promotes rot. Water will seep in eventually, get trapped by the fiberglass and do its dirty work. I did paint a thin coat of epoxy over the wood (I couldn’t help myself), but I forced myself to follow the advice of fellow builders and fiberglassed up to, but not over, the keel board. The only challenge to fiberglassing, as far as I can tell, is learning to apply even coats and avoid drips. In this regard, my skills are poor but improving. The trick, I am learning, is to apply thin coasts. It’s temping to pour on the epoxy in order to get a quick buildup, but this approach almost guarantees a lumpy, uneven finish. The port side was the most uneven; the starboard side was a little better, reflecting the slow evolution of my skills. I had better luck with the hull sides, which I glassed a couple of days later. For these vertical sides, I couldn’t pour the epoxy over the fabric, so I decided to use a small paint roller. I found that the foam roller easily saturated the cloth, but prevented unnecessary buildup. Each coat went on quickly and, by the end of the day, I felt like an old pro. I hung around for and extra half hour, smoothing out a few drips and sags, but the end result was a surprisingly even finish. So the step I most feared turned out to be not so bad after all. You are currently browsing the Build a Boat, Sail Away blog archives for July, 2010.